Dominique Levesque followed her dream to be a designer. 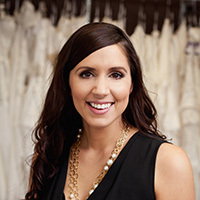 Now she's one of Ottawa and Gatineau's biggest wedding and prom dress purveyors. Welcome to Dominique Levesque Bridal, we are the largest bridal salons serving the Ottawa and Gatineau area. In April 2000 we opened our first boutique in Gatineau. The beginnings were simple but based on a well established knowledge of the fashion business. Armed with her degree and fashion experience Dominique Levesque has grown her business to two locations and a multitude of other endeavours to further the knowledge of her clients either through blogging or her Ask The Expert T.V. segments. Dominique has won several awards, the more recent ones include Forty under 40, The Ottawa Wedding Award in the women's bridal fashions category, and the Tsirmpa award recognizing her community involvement in a variety of charities, such as Leucan, Run for the Cure, Arthritis Society, Because I am a Girl, and the Ottawa and Gatineau food banks. Dominique hands selects each dress that comes into the boutique with her clientele in mind, from elegant and simple to over the top statement pieces. Come and see our impressive selection of wedding gowns, bridal party attire, prom dresses, and accessories. Our experienced stylists will assist you in choosing the perfect dress for your occasion. We invite you to browse our website and see the different services we offer. If you need more information or would like to schedule an appointment please don’t hesitate to contact us.